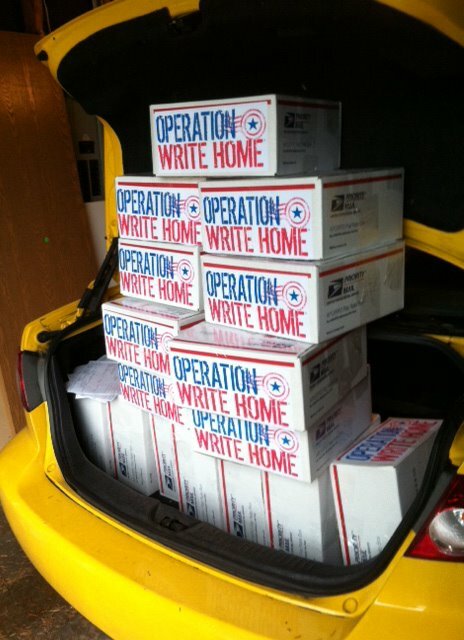 This week our volunteer shippers packed up and sent out 45 boxes of cards to our heroes! We always slow down a little after the holidays, though the requests increase during December – so we have a long waiting list growing. 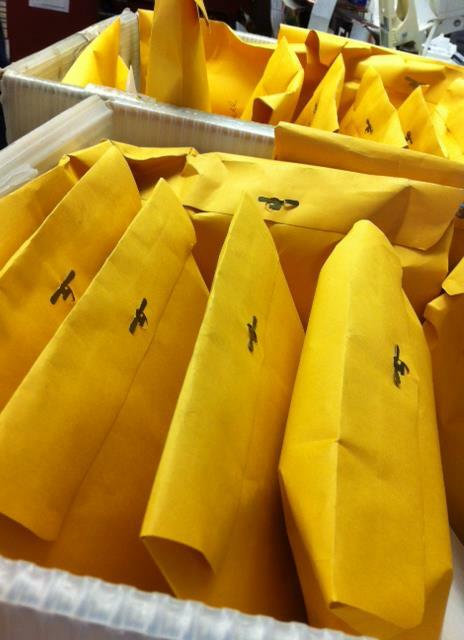 After the holiday blitz of AnyHero mail, we’re also starting to run out of letters to include in our boxes! The stacks aren’t as big as they ought….so if you’re able to help your shipper out by including some AnyHero letters, please do! 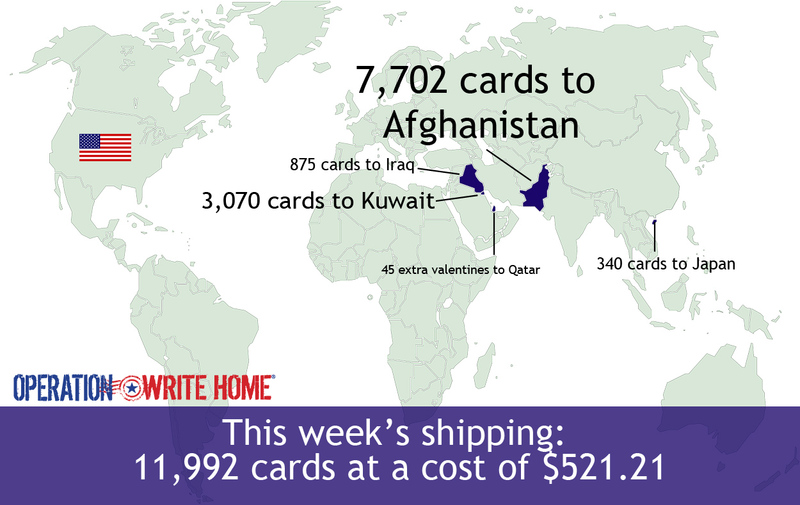 This past week, the first week of the new year – OWH shipped 44 boxes with 12,360 cards at a cost of $500.00….thank you to everyone who makes this possible, both crafters and financial donors alike! 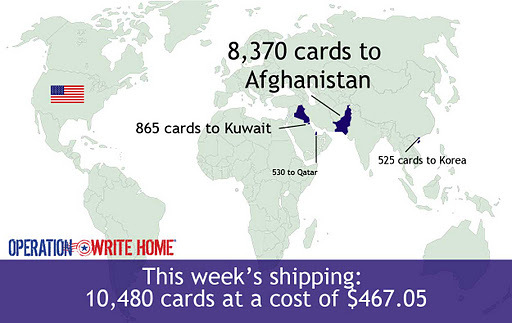 This week a whopping 62 boxes with 17,595 were mailed out – at a cost of $754.90! Yeeeeehaw! 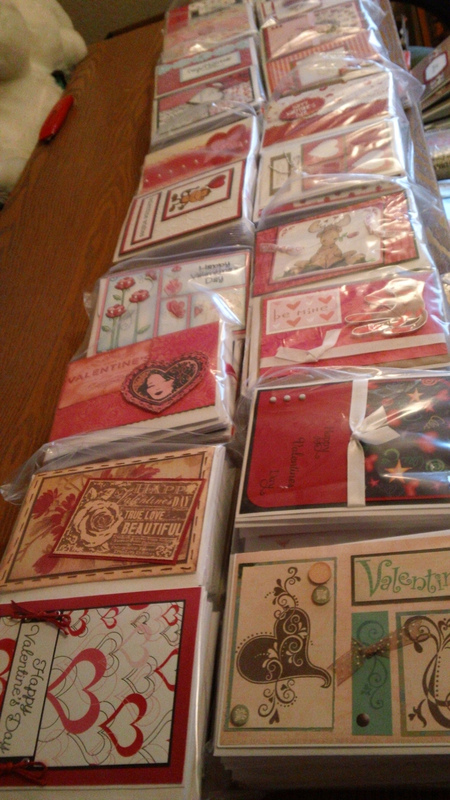 We finally had enough valentines to ship in earnest! Thank you to everyone who came through at the last minute, our heroes and their families will be so happy! 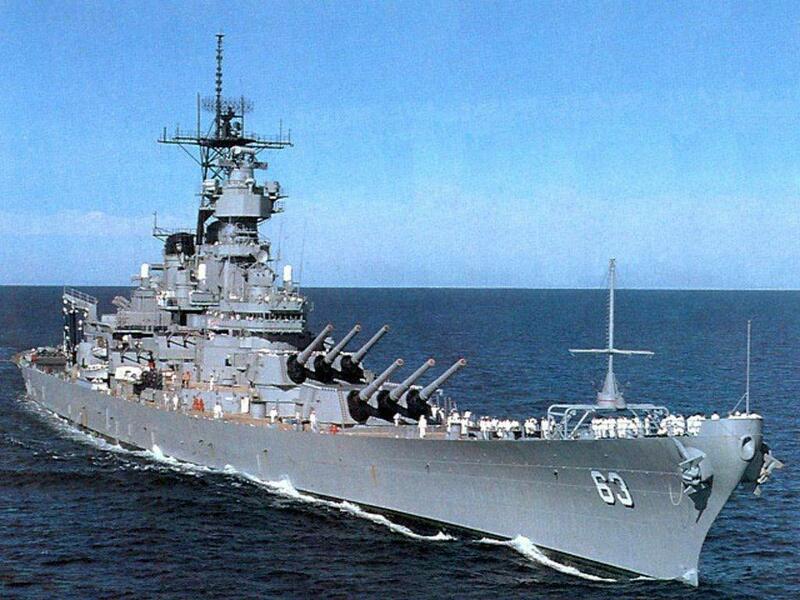 One of the next tasks ahead of us (at least ahead of Sandy!) is setting up the automated receipt summaries for 2011; stay tuned in the next two weeks for one to arrive in your inbox, if we have your email address. 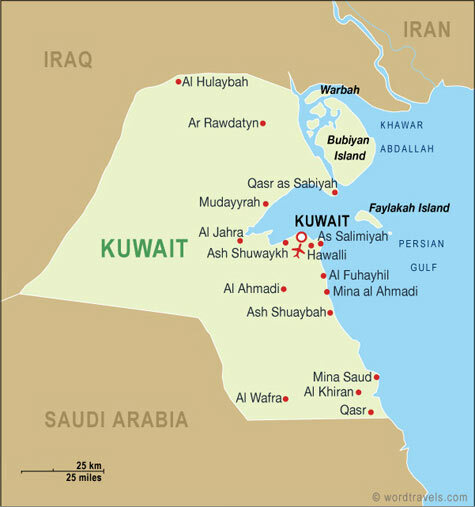 The annual report is also in progress – and will be posted here by the end of January! 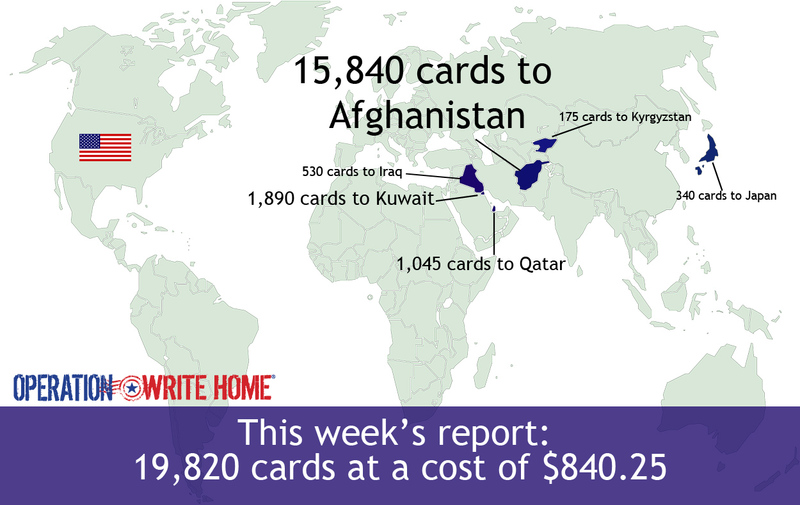 This week 12,592 cards were mailed out – at a cost of $851.45! Many of these were Christmas AnyHero mail, and may or may not arrive in time for Christmas Day, but will be loved nonetheless. 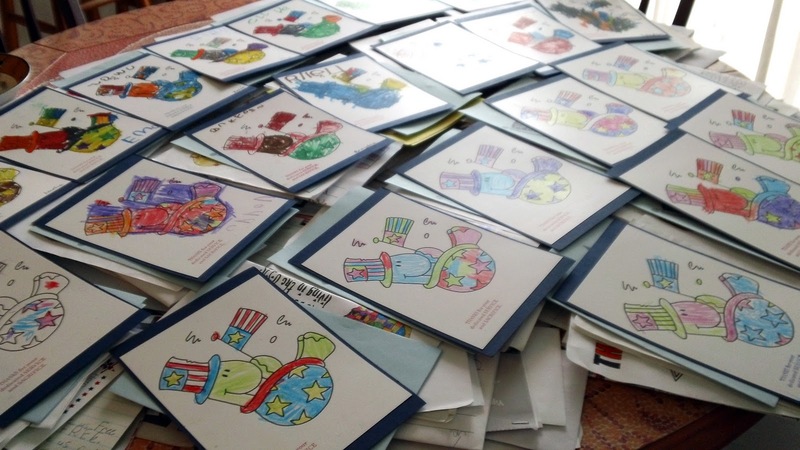 Many thanks to all who wrote notes for our heroes this holiday season! We’re staging valentines that will be matched up with cases of cookies from Archway…here’s the west coast batch, ready to meet up on that hot date with cookies…and a honeymoon in Afghanistan! 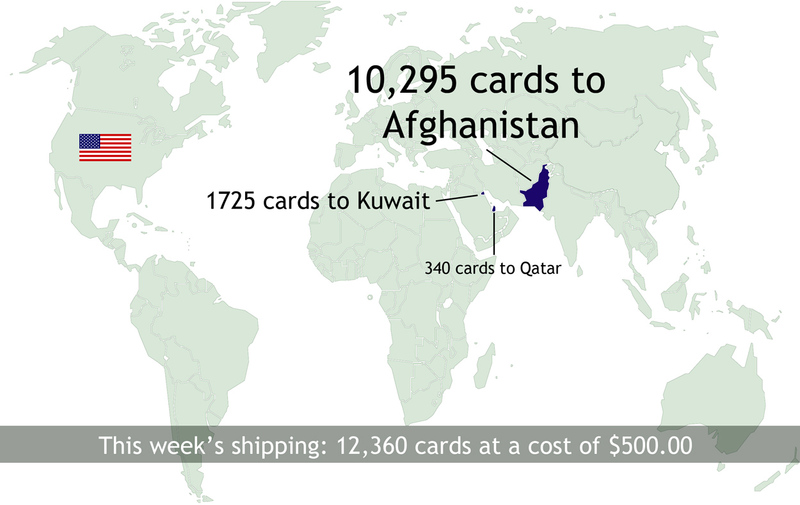 We did it – we went over 5000 cards in the Archway Challenge!! WOOHOO! Congrats to our heroes who are the real winners – they get COOKIES! And in case you missed it – don’t forget to check out the weekend vlog – you might win some stamps if you get a comment in by tonight!